GROOTS Kenya in partnership with other Women’s Rights Organizations and development partners among them UN Women, FEMNET, WE Effect, Equal Measures 2030, SDGs Kenya Forum, Women Empowerment Link, CREAW, Help Age International, PIPE Kenya, Global Fund for Women, Christian Aid and Diakonia organized a two day National Rural Women’s Convening on the 13th & 14th December 2017 in Nairobi Kenya targeting at least 300 rural women and girls drawn from across Kenya. To flag out challenges and opportunities for advancing rural women and girls in line with national, regional and internationally agreed instruments with particular focus to Kenya’s Vision 2030 and Sustainable Development Goals under the Global Agenda 2030. To facilitate effective participation/engagement of rural women & girls in the CSW62. 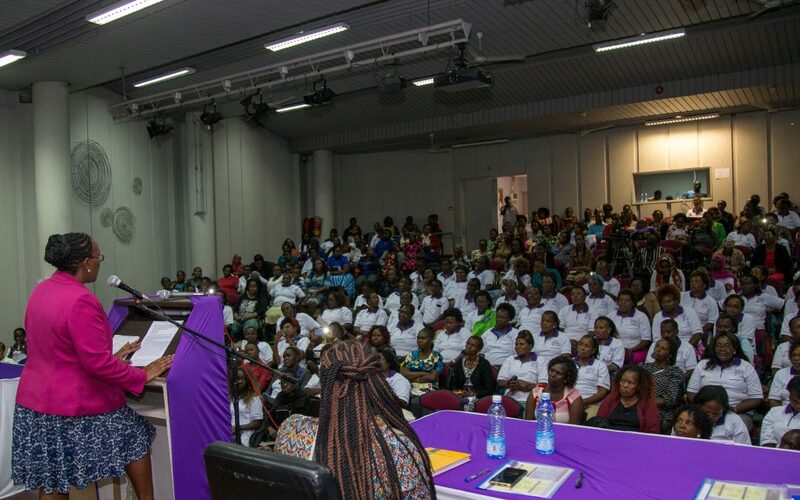 The convening brought together over 300 women and girls from 27 counties including , Nairobi, Narok, Meru, Taita Taveta, ElgeyoMarakwet, Tana River, Migori, Kisii, Nyamira, Nakuru, Kiambu, Mombasa, Kilifi, Kwale, Kajiado, Machakos, Laikipia, Isiolo, Marsabit, Kirinyaga, Garissa, Kakamega, Busia, Homabay, Kericho, Bomet and Kitui. These being the key issues affecting women and girls in Kenya. Other key stakeholders at the convening included the Cabinet Secretary, Ministry of Gender, Public Service and Youth Affairs Hon. Sicily Kariuki, the Kenya Women Parliamentary Association, the National Gender and Equality Commission, female Members of Parliament, the Council of Governors, the Kenya Private Sector Alliance, the Catholic Justice and Peace Commission, the Institution of Surveyors of Kenya among others. The outcome document from the convening will be given to the Cabinet Secretary for consideration on the Common Position Paper for Kenya. The sixty-second session of the Commission on the Status of Women (CSW62) is scheduled to take place at the United Nations Headquarters in New York from the 12th to 23th of March 2018 where Representatives of Member States, UN entities, Development partners and Civil Society from all over the world will convene yet again to review the progress made in achieving gender equality and women’s empowerment. The priority theme for 2018 is Challenges and opportunities in achieving gender equality and the empowerment of rural women and girls; while the review theme is Participation in and access of women to the media and information, and communications technologies and their impact on use as an instrument for the advancement and empowerment of women (agreed conclusions of the forty-seventh session). Additionally, the 62nd CSW Session is expected to table and discuss the HIV/AIDS resolution. GROOTS is a national movement of grassroots women-led community-based groups (CBOs) and Self Help Groups (SHGs) in Kenya.